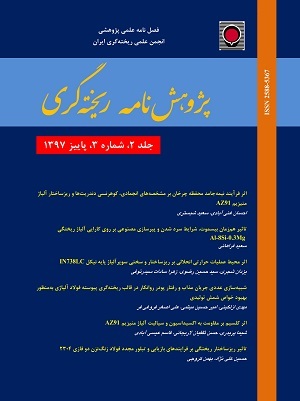 هدف از پژوهش حاضر، بررسی تاثیر فرآیند نیمه‌جامد محفظه چرخان RCP بر مشخصه‌های انجمادی آلیاژ AZ91 و ارتباط آن با تغییرات مورفولوژی ریزساختار است. به این منظور، ضمن طراحی سیستم تولید به روش نیمه‌جامد، آنالیز حرارتی در حین فرآیند نیمه‌جامد RCP صورت گرفت. نتایج نشان داد که اعمال چرخش محفظه، باعث کاهش دمای پایان انجماد تا حداکثر °C 14 شده است، با این حال، این اثر بر دمای جوانه‌زنی فاز اولیه α-Mg، بسیار محدودتر بوده است. همچنین، دمای دامنه‌ی انجماد تا حداکثر °C 16، افزایش یافت که منجر به کنترل بهتر فرآیند نیمه‌جامد شد. مقایسه نتایج کسر جامد و ریزساختار نشان می‌دهد که در سرعت RPM 150 علی‌رغم کم‌بودن سرعت سرمایش، جریان جابجایی موثر سیال برای اثر‌گذاری بر رشد دندریت‌های اولیه و کاهش گرادیان حرارتی در مخلوط نیمه‌جامد، ایجاد نشده است و بنابراین ریزساختاری با مورفولوژی غیردندریتی، در این سرعت چرخش حاصل نشده است. در سرعت RPM 210، افزایش شدید سرعت سرمایش اندازه‌گیری شد که باعث کاهش اثر جریان جابجایی موثر سیال شده است. به نظر می‌رسد در سرعت چرخش RPM 180، موازنه‌ی اثر سرعت سرمایش و جریان جابجایی سیال، ایجاد شده لذا، کمترین کسر جامد و مطلوب ترین کیفیت مورفولوژی ریزساختاری حاصل شده است. اعمال چرخش، با کاهش حداکثر دمای °C 15 و افزایش کسر جامد به میزان حداکثر 6 %، در نقطه‌ی کوهرنسی دندریت‌ها همراه بوده که نشان می‌دهد فرآیند نیمه‌جامد RCP باعث به تعویق انداختن نقطه‌ی DCP و کاهش عیوب ناشی از ریخته‌گری خواهد شد. The purpose of this study was to investigate the effect of the semi-solid rotating container process (RCP) on the characteristics of solidification of AZ91 magnesium alloy and its relationship with microstructure morphology. Thermal analysis (CA-CTA) performed under controlled conditions along with semi solid casting process. Rotation of the container, caused decrease in solidification temperature up to maximum 14°C. However, this effect has been much more limited on nucleation temperature of primary α-Mg phase. The temperature of solidification range increased to a maximum of 16 °C, which led to a better control of the semi-solid process. Comparison of the results between fraction of solid and microstructure showed that rotation with 150 RPM is unable to create an effective fluid flow, in spite of low cooling rate. Rotating with 210 RPM, caused sharp increase in the cooling rate and reduced the effect of effective fluid flow in the slurry. It has been observed that the balance between the effect of the cooling rate and the effective fluid flow has been created at the rotational speed of 180 RPM. Thus, the least solid fraction and the most desirable quality of the morphology have been achieved in the microstructure. Rotation of the container decreased the temperature to a maximum of 15°C and increased the solid fraction to a maximum of 6 % at dendrite coherency point (DCP). This proved that RCP casting method postponed the DCP and therefore, the defects caused by casting can be reduced. John D., Easton M., Qian M., Taylor J., Grain refinement of magnesium alloys: A review of recent research, theoretical developments, and their application, Metallurgical and Materials Transactions A, 2013, 44, 2935-2949. Kulekci M.K., Magnesium and its alloys applications in automotive industry, International Journal of Advanced Manufacturing Technology, 2008, 39, 851-865. Guangyin Y., Yangshan S., Wenjiang D., Effects of bismuth and antimony additions on the microstructure and mechanical properties of AZ91 magnesium alloy, Materials Science and Engineering: A, 2001, 308, 38-44. Burapa R., Janudom S., Chucheep T., Canyook R., Wannasin J., Effects of primary phase morphology on mechanical properties of Al-Si-Mg-Fe alloy in semi-solid slurry casting process, Transactions of Nonferrous Metals Society of China, 2010, 20, s857-s861. Thanabumrungkul S., Janudom S., Burapa R., Dulyapraphant P., Wannasin J., Industrial development of gas induced semi-solid process, Transactions of Nonferrous Metals Society of China, 2010, 20, s1016-s1021. Langlais J., Lemieux A., Kulunk B., Impact of the SEED processing parameters on the microstructure and resulting mechanical properties of A356 alloy castings, Transactions-American Foundrymen’s Society, 2006, 114, 06-125. Doutre D., Langlais J., Roy S., The SEED process for semi-solid forming, in 8th International Conference on Semi-Solid Processing of Alloys and Composites, Limassol, Cyprus, 2004, 397-408. Nafisi S., Lashkari O., Ghomashchi R., Langlais J., Kulunk B., The SEED technology: a new generation in rheocasting, presented at the Light Metals Conference, Calgary, Canada, 2005. Nafisi S., Ghomashchi R., Semi-solid processing of aluminum alloys: Springer, 2016, 11. Das A., Ji S., Fan Z., Morphological development of solidification structures under forced fluid flow: a Monte-Carlo simulation, Acta Materialia, 2002, 50, 4571-4585. Fan Z., Semisolid metal processing, International Materials Reviews, 2002, 47, 49-85. Vogel A., Doherty R., Cantor B., Stir-cast microstructure and slow crack growth, in Solidification and Casting of Metals, Sheffield England, July 1977, 518-525. Nafisi S., Lashkari O., Ghomashchi R., Ajersch F., Charette A., Microstructure and rheological behavior of grain refined and modified semi-solid A356 Al–Si slurries, Acta Materialia, 2006, 54, 3503-3511. Bolouri A., Zhao Q. F., Côté P., Chen X. G., Microstructure and Rheological Properties of Semi-Solid 7075 Slurries Using SEED Rheocasting process, Solid State Phenomena, 2016, 256, 288-293. Lashkari O., Ghomashchi R., The implication of rheology in semi-solid metal processes: An overview, Journal of Materials Processing Technology,2007, 182, 229-240. Gholizadeh R., Shabestari S., Investigation of the effects of Ni, Fe, and Mn on the formation of complex intermetallic compounds in Al-Si-Cu-Mg-Ni alloys, Metallurgical and Materials Transactions A, 2011, 42, 3447-3458. Shabestari S., Malekan M., Thermal analysis study of the effect of the cooling rate on the microstructure and solidification parameters of 319 aluminum alloy, Canadian Metallurgical Quarterly, 2005, 44, 305-312. Ghoncheh M., Shabestari S., Effect of cooling rate on the dendrite coherency point during solidification of Al2024 alloy, Metallurgical and Materials Transactions A,2015, 46, 1287-1299. Yavari F., Shabestari S., Effect of cooling rate and Al content on solidification characteristics of AZ magnesium alloys using cooling curve thermal analysis, Journal of Thermal Analysis and Calorimetry, 2017 129, 655-662. Chai G., Backerud L., Rolland T., Arnberg L., Dendrite coherency during equiaxed solidification in binary aluminum alloys, Metallurgical and Materials Transactions A, 1995, 26, 965-970. Malekan M., Shabestari S., Effect of grain refinement on the dendrite coherency point during solidification of the A319 aluminum alloy, Metallurgical and Materials Transactions A, 2009, 40, 3196. Nami B., Shabestari S., Razavi H., Mirdamadi S., Miresmaeili S., Effect of Ca, RE elements and semi-solid processing on the microstructure and creep properties of AZ91 alloy, Materials Science and Engineering: A, 2011, 528, 1261-1267. Ghoncheh M., Shabestari S., Abbasi M., Effect of cooling rate on the microstructure and solidification characteristics of Al2024 alloy using computer-aided thermal analysis technique, Journal of Thermal Analysis and Calorimetry, 2014, 117, 1253-1261. Gowri S., Samuel F. H., Effect of cooling rate on the solidification behavior of AI-7 Pct Si-SiC Metal-Matrix Composites, Metallurgical and Materials Transactions A, 1992, 23, 3369-3376.